I admit that for a while I only wanted to eat kale because it was a so frequently praised as a superfood by many a blogger. 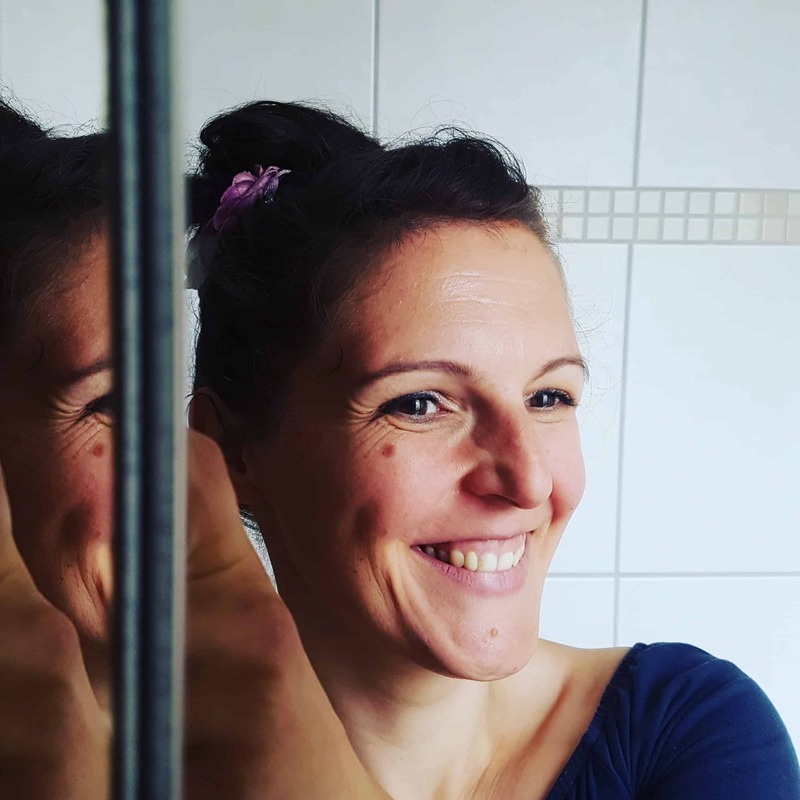 But I was also curious about the newfangled way of eating a vegetable that in Germany, is only ever used in a rather oldfashioned dish, cooked with steel-cut oats and looking pretty revolting. So to try it as crispy chips or in a fresh salad seemed like the logical step to take for someone who’s always been eager to move beyond traditions. But as much as I wanted to like it – I really didn’t. My then 1-year-old, adventurous first-born happily gobbled up the kale chips experiment but I kept gulping down water to get rid of the dry scratchy bits getting stuck in my throat. 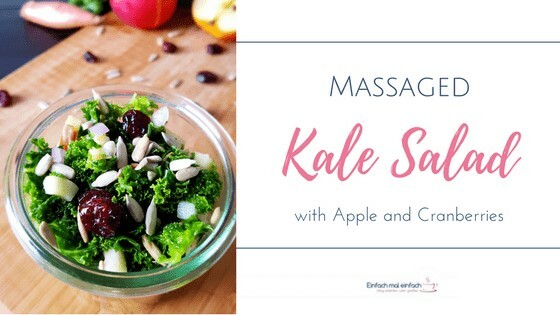 So when I first heard about this little trick of massaging kale before using it in a salad, I was all ears. All you need to do is add salt to your big bowl of curly kale leaves. I prefer to cut or tear them into bite-sized pieces beforehand but larger leaves with just the stem removed would work as well. With the salt added, start kneading the kale with clean hands as if you were dealing with dough. Continue to work it for about 1-2 minutes, taking breaks whenever the muscles in your hands require them. You will notice that the volume of your kale leaves reduces down to about a third. 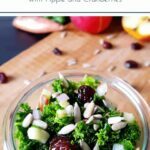 The simple vinaigrette in this kale salad recipe is delicious as it is but you could certainly use a different dressing that you like. However, because of the salt already added to the salad at this early stage, it is very important to leave out any additional salt when preparing the dressing. Therefore, using a ready-to-go dressing from the shop is not an option with this technique. If you have considerably less than 20 large kale leaves, start by using only half the salt. You can always add more in 1/4 tsp steps. If you are sensitive and prefer your food on the less salty side of things, then use half the amount of salt with only half of your kale and add more leaves once the first bunch has reduced in volume. The original recipe suggests adding gorgonzola cheese which I have never gotten a chance to try. Mainly because my courage to experiment abandoned me whenever I was about to buy it. So if you love blue cheese, definitely give this a shot. Alternatively, some feta cheese would be a nice addition of protein. But we are delighted with this salad as it is. I used to add honey to the dressing and leave out the shallot so get a slightly sweeter, more fruity salad. If this sounds good to you, go ahead and add a tablespoon of honey to the dressing. As someone who hated onions as a child, I was reluctant to add raw onion to a salad (I don’t usually keep shallots in the house). Yet I am happy to report that adding red onion very finely chopped works just as great as shallots. 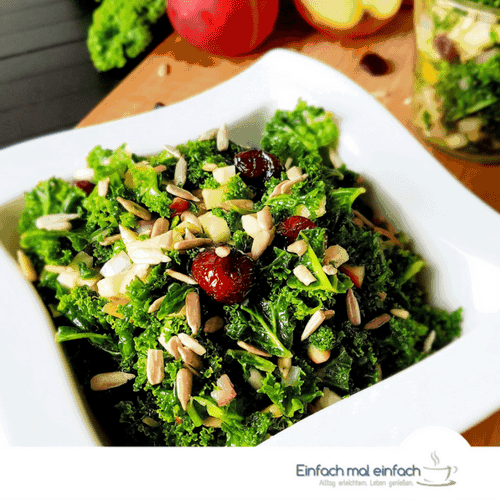 You can definitely skip the step of toasting your sunflower seeds if this step would be keeping you from making this massaged kale salad. However, if you have the energy, it will make this salad that much more delightful. So there you have it. 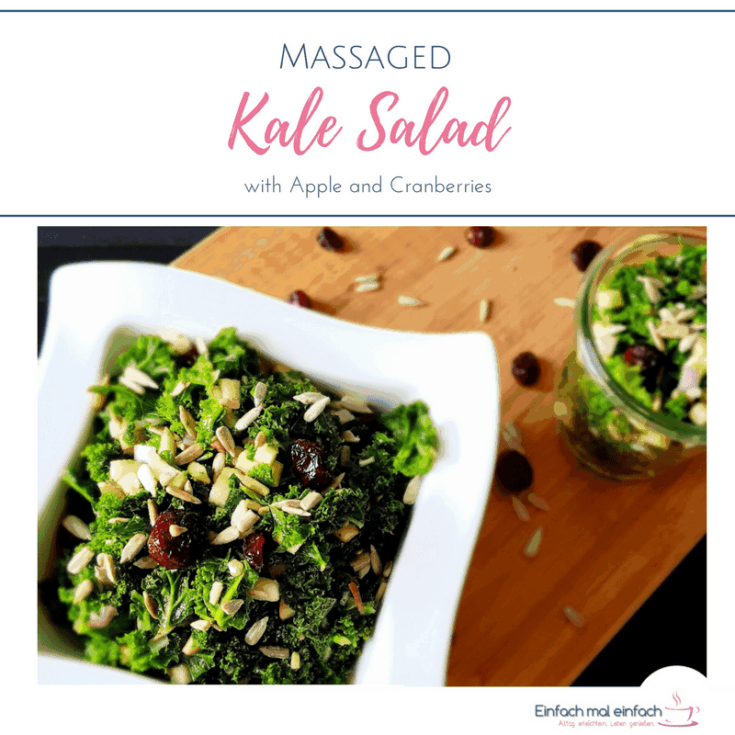 Now go and get a big bunch of beautiful curly leave kale and see for yourself, how the step of massaging will transform the resulting salad. Prepare it following the recipe below or start experimenting with the ingredients as I mentioned above. Either way, I’m sure this salad will become a new favourite very quickly. Then let me know how it went by leaving a comment! If you love kale but find raw curly kale too scratchy, this recipe is for you! Massaging the leaves with salt beforehand leaves you with a smooth and delicious bowl of green goodness. Wash kale, remove stems and cut or tear into bite-sized pieces. Add kale to a large bowl and sprinkle with salt. Massage and knead the salt into the leaves for about 1-2 minutes until the leaves feel soft and volume has reduced to about a third. Chop red onion and apple. 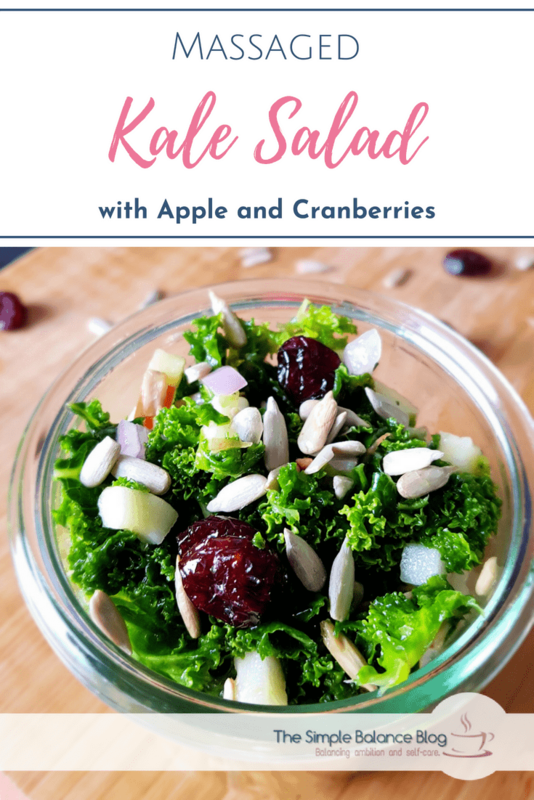 Add to kale with cranberries. Lightly toast sunflower seeds in a hot pan until they begin to change colour and add them to the bowl. Finally, add olive oil and apple cider vinegar to the bowl and stir well to get everything mixed evenly. Dried currants could be substituted for cranberries. Shallots can be substituted for red onions. Feel free to add 2 ounces of blue cheese or feta cheese for extra protein. For a slightly sweeter, more fruity salad, omit the onion and mix the olive oil and apple cider vinegar with 1 Tbsp of honey before adding it to the salad. You can omit the step of toasting the sunflower seeds if you are crunched for time.